Woody and his crew are almost done with stripping the paint. He's now working on the two porches, which are the fiddly bits. I went out on the scaffolding -- I can now get onto it easily through a bedroom window or the Accordion Room window -- and took some photos. The is the front bay from the front porch. 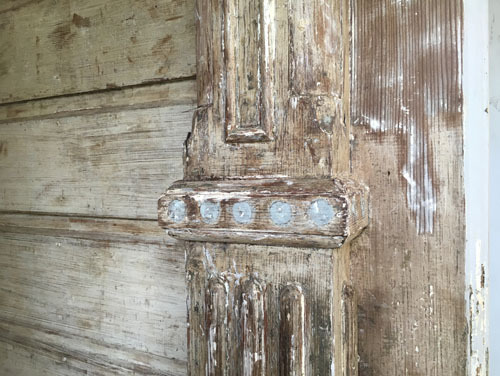 You can see that Woody has started stripping paint off the columns of the front porch. 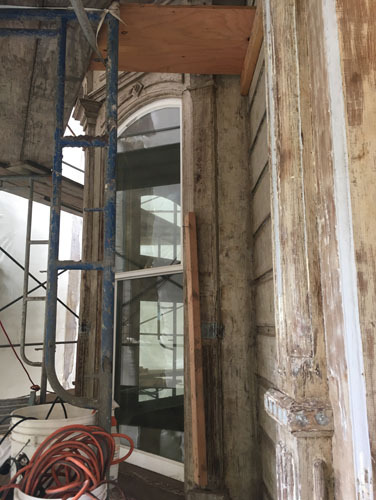 This is the second story of the front bay, plus the bathroom window. I'm not sure what those pieces of wood are for. The trim around these windows is in better shape than the trim on the east side of the house (this is the north). 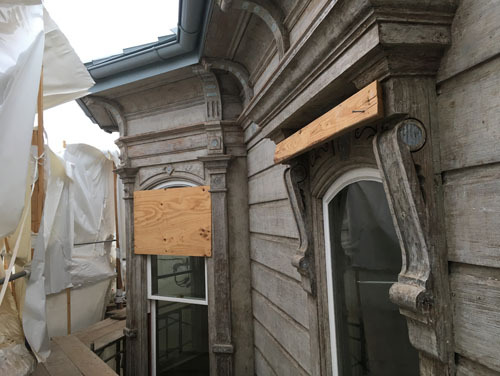 Most of the corbels at the roof line are in good shape, but are missing the rounded lozenges and the bottom piece of trim. woody is having a lot of these pieces made, and fabricating the ones that would otherwise be impossible to find. In the meantime, his crew is sanding. 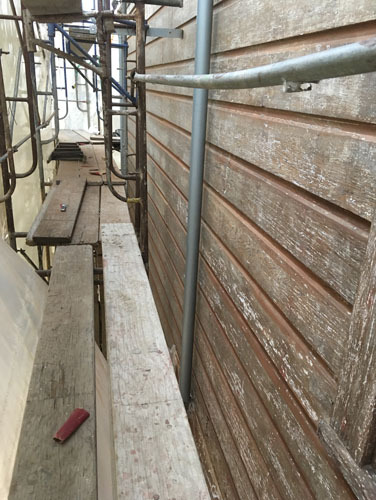 The siding is looking more and more like a piece of furniture. The sanding gets the wood ready to accept the epoxy, which will preserve it. One thing we are working on right now is restoring the side porch. 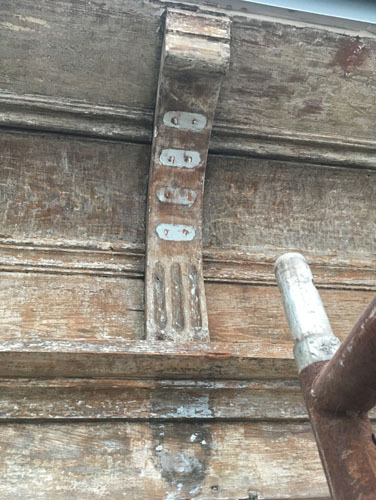 Much of the original was missing when we bought the house, but thanks to paint marks and the fact that the Victorians tended to reuse the same profiles all over the place, we are piecing together what it looked like. Today Woody and I went over some sketches I made of the combination of our discoveries and also detailing from other similar porches on houses of the same era. I think it will look amazing when it is done. A few weeks ago Woody told me the ceiling wasn't in good enough shape to just varnish and leave as bare wood -- other clients of his have done this and it is gorgeous. That's actually fine because I was planning to paint it light blue as is traditional on porch ceilings. 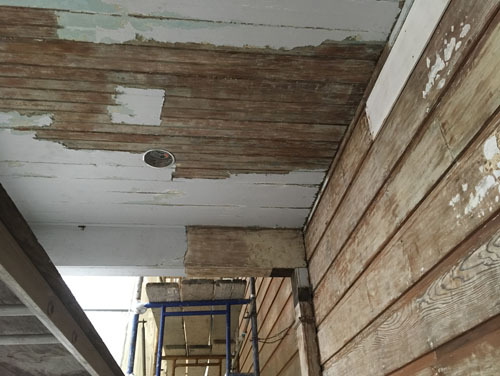 This ceiling has seen many insults over the last several decades owning to having been built with no slope, and while we've finally fixed that, the wood is stained and a little ugly. Plus we removed one light fixture and put in two exterior ceiling cans, so there are patches. Basically, it will look great painted and I won't miss the look of the wood. Everything is taking longer than I would like, and we just spent another wodge of money on wood trim replacements. But it looks amazing and every day we make progress. This process was never going to be fast, but right now it will just be what it is.